As part of Phase II of the Texas Pollutant Discharge Elimination System Program, storm water discharges from small municipalities located in urbanized areas are required to employ a program that reduces pollutants from storm water runoff. This is also in accordance with the Federal Clean Water Act and state and local regulations. This program protects residents not only from the harmful storm water runoff but also from the harmful effects of backflow. 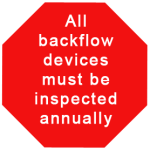 DFW Airport is required to conduct annual backflow testing as part of this program. City Backflow Testing is licensed and certified within the Dallas/Ft. Worth Megaplex, of which DFW Airport is a part, and conducts affordable backflow testing of all backflow devices.